Permanently installed Pit-Mount Dock-Lifts are available in standard capacities from 5,000 lbs. 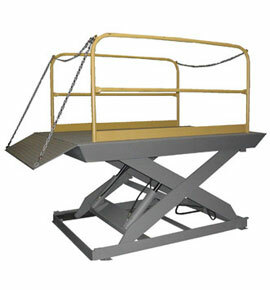 to 25,000 lbs., to accommodate everything from hand carts to power pallet jacks to lift trucks. Higher capacities are also available. Because Pit-Mount lifts are flush with the grade when fully lowered, they are protected from accidental damage caused by careless truck operation. The heavy-duty reinforced platform is engineered for minimal deflection while raising and lowering; and positive stop blocks eliminate platform deflection. Standard platform width range from 72" to 96" and standard lengths from 96" to 144", with beveled toeguard edges to meet ANSI safety requirements. The steel tread bridge plate is 12" OAW x 72" OAL, with two (2) chains. The handrails are removable for loading flexibility. U.S. Post Office options are also available. The standard power unit is configured with a 5HP electric motor for fast raising. The motor is designed to operate on 240/480-volt, 3 phase, 60 HZ power. Consult factory for other electrical options. A onepiece aluminum manifold block, solenoid valve, and check valve are located in the remote-mounted power unit to control hydraulic functions. Electrical components are contained in a NEMA 4 and NEMA 12 enclosures to keep dust and moisture out and fuses protected. DU maintenance-free bearings on all pivot points minimize wear and eliminate the need for greasing. Removable pins simplify removal of cylinders and scissor legs and a maintenance strut is provided to keep Dock-Lift raised during hydraulic servicing. Copperloy Dock-Lifts are warranted for a period of 5 years against defects in workmanship and materials on all structural parts, 6 months on hydraulic cylinder seals, 6 months on electrical parts, and 1 year on the hydraulic power pack.